This is the ultimate stoner car. Use the hookah up front to get stoned, then when you get the munchies you can just hop in back and grill some hot dogs. IF YOU SAW Louis Matter’s car rolling along the streets of San Diego, Calif., you’d probably consider it just another attractive automobile. But if you looked inside the car you’d find everything from a barbecue pit to an Arabian water-cooled pipe. 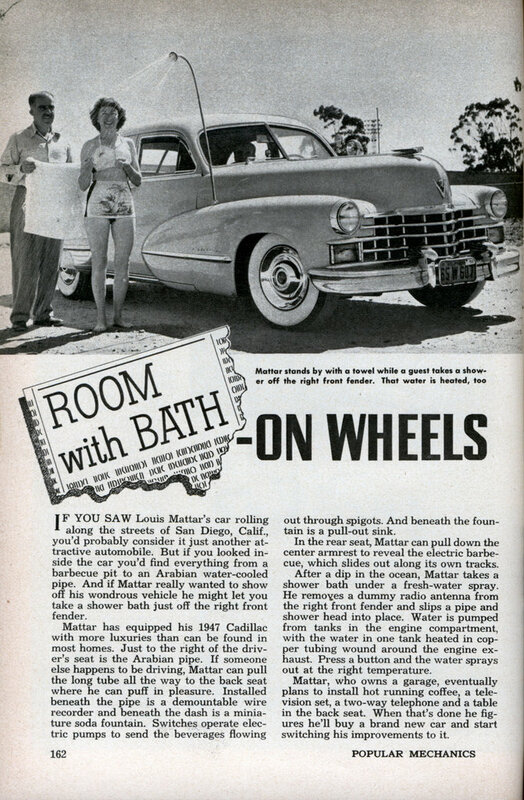 And if Mattar really wanted to show off his wondrous vehicle he might let you take a shower bath just off the right front fender. out through spigots. And beneath the fountain is a pull-out sink. In the rear seat, Mattar can pull down the center armrest to reveal the electric barbecue, which slides out along its own tracks. After a dip in the ocean, Mattar takes a shower bath under a fresh-water spray. He removes a dummy radio antenna from the right front fender and slips a pipe and shower head into place. Water is pumped from tanks in the engine compartment, with the water in one tank heated in copper tubing wound around the engine exhaust. Press a button and the water sprays out at the right temperature. Mattar, who owns a garage, eventually plans to install hot running coffee, a television set, a two-way telephone and a table in the back seat. When that’s done he figures he’ll buy a brand new car and start switching his improvements to it. Apparently Mr. Matter had better things to do than smoke dope. In 1954 Louis Matter of San Diego, California and two friends completed the first non stop motor trip from Anchorage, Alaska to Mexico City, Mexico, a distance of 6,391 miles. 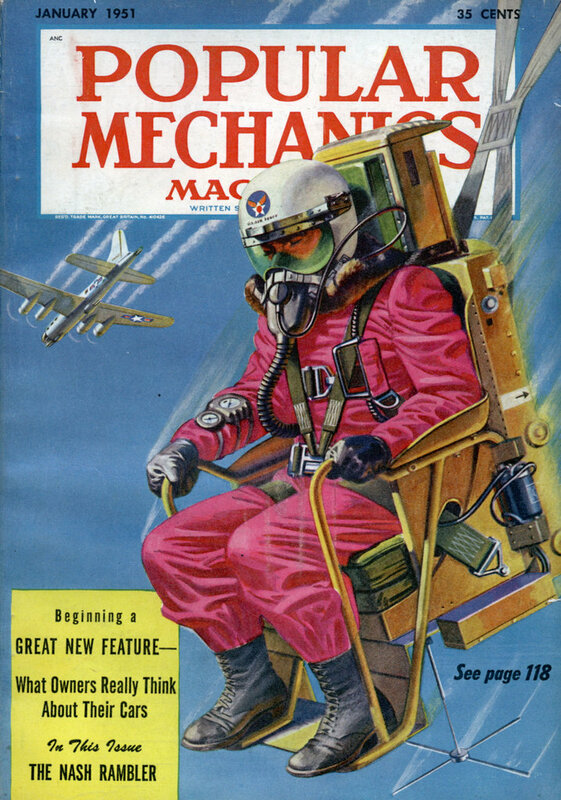 I seem to recall that Popular Mechanics covered that story as well. That’s the same car which appeared on TV periodically back in the 50’s and 60’s, where they could change a tire or the oil while the car was driving. It’s in the car museum in Balboa Park in San Diego, with a player showing videos of one of the TV shows. I saw it there in July. Wow, really? I live in San Diego, I’ll have to check that out. Thanks Mike. With that lead I looked up the web site. I always like finding out “whatever happened to” something in one of these old magazines. I saw the car and the video there for the first time in November 07. I was amazed! A car that changes its own oil!! wish mine did that! I think this would make a great movie, certainly it couldnt be any worse then the garbage hollywood has put out this year. Louie’s Cadillac is truly the American dream vehicle. I have been following it in the popular mechanics magazines for 50 years. There was another remarkable vehicle, a 1951 Cadillac, with a total of seventy-one (71!) different dashboard instruments covered in an article in Science and Mechanics. Not as spiffy as Louie’s car, but a great achievement, nonetheless. I have many other fond memories of non-automobile home inventions, including the attractive, tile-topped kitchen divider/table/dishwasher combination, including detailed plans. It was remarkable that people built such contraptions, and even more remarkable that the magazines wrote articles on them, which plans for others to copy. I really loved one handyman’s solution to his two vicious Pomeranians, Tico and Tina, who had to be kept apart from each other or “the fur would fly”. Their row house backyard was filled with ramps, steps, gates, pens and sections of grass, with gates and chutes manipulated by an intricate system of pulleys and ropes, all to keep the two mutts apart. And, of course, detailed plans!